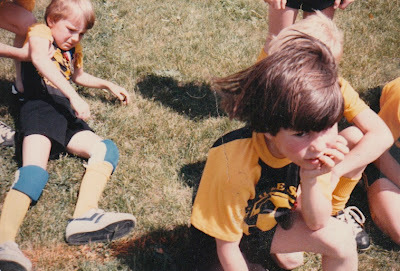 I started playing soccer when I was six years old. I wasn't particularly good, but I happened to be on a really good team that year. We made it all the way to the league championship game. And lost. I threw a fit, the likes of which you wouldn't believe. I was so upset I refused to take part in the team picture after the game. My dad tried to pick me up off the ground and place me in with the rest of the team for the team photo and I wanted no part of it. This photo of my fit has become a family classic. do they have a picture of you singing, "My baby takes the morning train..."
...AND THIS IS THE MOST MILD MANNERED OF ALL MY SONS!!! ...AND TELL MELISSA WE HAVE PICTURES OF YOU DOING EVERYING...AFTERALL, YOU WERE THE BABY!!! Wow. I had no idea you could be so dramatic.